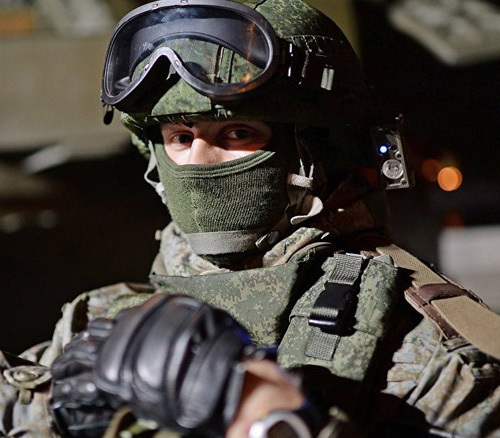 Watches capable of operating smoothly even when exposed to electronic warfare, as well as electromagnetic pulses generated by a nuclear explosion, will become part of the Russian Armed Forces’ Ratnik “Future Soldier” outfit, Rostec’s press service announced. The self-winding timekeeper easily withstands air temperatures ranging from 40 degrees below and 50 degrees above zero Celsius and is totally waterproof too. Complete with the wristband, the watch weighs less than 100 grams and has a guaranteed service live of at least 10 years. “The watch will keep ticking when subjected to solar radiation and even electromagnetic pulses resulting from nuclear explosions, etc.,” TsNIIMash Chief Designer Oleg Faustov said. Earlier, the Head of the Central Research Institute of Precision Machine Building (TsNIIMash) Dmitry Semizorov said that the Ratnic outfit had successfully passed the hard test of combat missions in Syria with all of its elements acting with clockwork precision. The next-generation Ratnik-2 infantry gear, which is now being supplied to the Armed Forces, features modern firearms, advanced body armor, optical, communication and navigation devices, as well as life support and power supply systems designed to operate round the clock in any weather. Russian engineers are now working on a third-generation of the Ratnik combat outfit (Ratnik-3), which will boast a helmet with an integrated control system, a combat exoskeleton, mine-resistant boots and other elements.